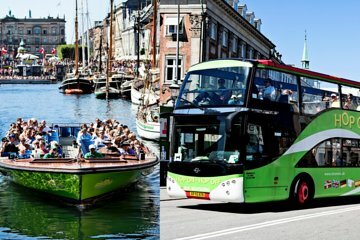 See the city of Copenhagen by train, boat, and bus with this multi-vehicle, hop-on, hop-off pass that is valid for 72-hours. Choose to travel one or all of the three distinct routes and hop off and on as many times as you want. Customize your day by selecting stops from each route or stay onboard for the entire loop to see it all. Good genral overview off Coopenhagen. Seata are hard plastic and uncomfortable. At times confusing as to where different lines start. Boat ride excellent. Best way to see all of the city but had a few difficulties. Purchased ticket that included train and train was out of service. Many plug-ins for ear jacks were old and sometimes didn't make clean contact. Other than that, can't beat this service for seeing ther city.